How to convert mp3 to ogg? ESFsoft Video Converter, from its name, you must regard it only uses to convert video. But in fact, it is an audio converter as well. Ogg is an audio format that ESFsoft Video Converter supports, you are free to convert mp3 to ogg or convert ogg to mp3. How to convert mp3 to ogg by ESFsoft Video Converter? 1. Download and install ESFsoft Video Converter. Launch it. 2. Select the output format OGG that you want on ESFsoft Video Converter interface. 3. Click "Add" , choose the mp3 file you want to convert from PC. 4. Click "Convert" to convert selected and checked mp3 file. 5. 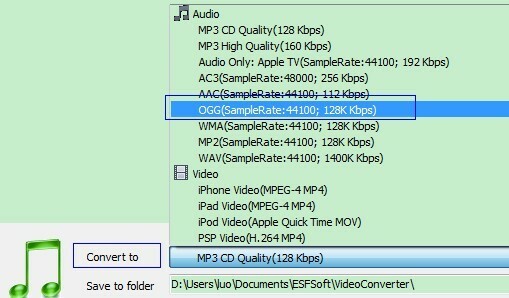 ESFsoft Video Converter is to automatically convert the file from mp3 to ogg. After finishing conversion, click "Open" (at lower right coner on the freeware's interface) you will find the converted file.